Let’s face it – maybe the last thing you want to do in an unfamiliar place is try to drive all over town, trying to find a restaurant, a shop, interesting things to see and do. You don’t want to ride along while a GPS chirps directions at you. You want to experience, explore, and discover the place you are visiting. Well, perhaps the best way to do that is by walking. Our bed and breakfast inn is located in historic, downtown Norman, OK. It’s location is excellent because it is within walking distance to some of the best places in town. Whether you’re here on-site figuring it out on the fly or planning ahead of time this list will help you know what’s close. And, check back often because we’re constantly updating this list. Getting away is all about relaxing. Why not grab a book and a lunch and head to one of the 7 parks within a mile’s walk of the Montford Inn? Check out Andrew’s Park, it’s the closest and largest park. It’s also the home of the May Fair Arts Festival each Spring. Other great parks within walking distance are the Lions Park, June Bensen Park, and Ruth Updegraff Park. Click on any of these links to see what each park offers and strikes your relaxing fancy. You get to know a town best by eating at places that are unique to the area, and Norman has no shortage of unique restaurants. While some of our favorite romantic restaurants can be found within walking distance, like Blu and Benvenuti’s, there are lots of others to choose from. You may want to visit a Norman coffee house, like Michaelangelo’s or the Gray Owl. We also love the list on Destination Norman, including Old Town Gyro’s and Kebabs and The Diner. Whether you’re looking for great antiques, clothing, jewelry, or specialty shops, Norman’s has got you covered! You can find specialty yarn at L&B Yarn Co or fresh produce at Sprout’s Farmer’s Market. This list may be helpful. Norman OK is OU Sooner country and Montford Inn and Cottages is within walking distance of campus and everything it has to offer – from OU Football and OU Basketball, to the Fred Jones Jr. Museum of Art, just to name a few. Throughout the campus there are beautiful spaces that are like parks themselves with amazing and unique artistic pieces. Featuring a statue of James Garner, a railway, and Legacy Trail, Norman’s downtown is beautiful just for strolling. See more of the great businesses nearby and downtown map from Downtown Norman here. 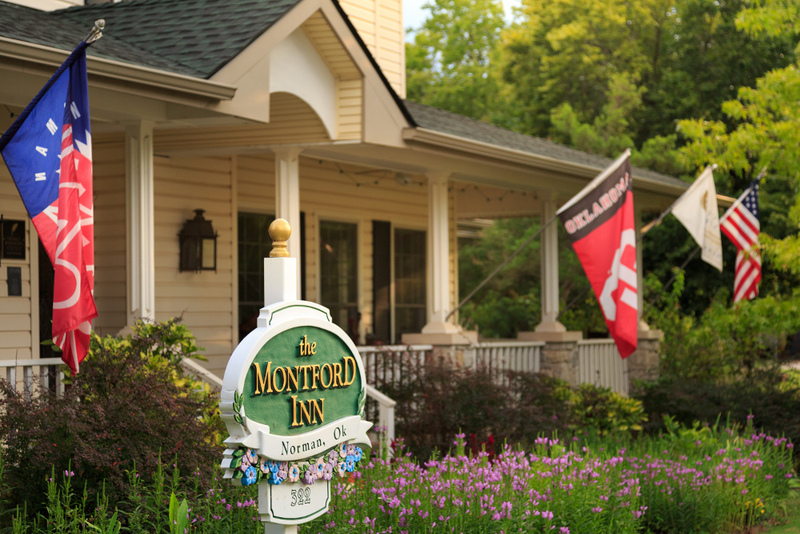 And at the Montford Inn and Cottages, we are more than happy to help you get to any of these places on foot with easy-to-understand directions, great recommendations, and hometown know-how. We would love to have you stay with us the next time you decide to explore Norman for yourself.